P eterborough schools are preparing to celebrate their green successes at the annual Peterborough Eco Education Awards (PEEAs), this year held at the Greater Peterborough UTC at Peterborough Regional College, on June 21, writes Peterborough Environment City Trust’s Environmental Education Manager Jill Foster. 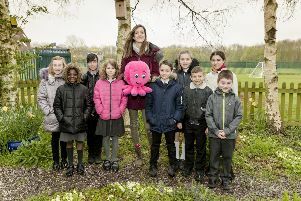 The Peterborough Eco Education Awards, sponsored by Skanska and organised by the charity PECT, is a celebration of the successes of schools that have participated in the Peterborough Eco Framework. The Eco Framework is run by PECT to embed knowledge of sustainability issues into classrooms to inspire the next generation of forward-thinking students. This celebration provides an excellent opportunity for Primary, Secondary and Special schools across the city to join together to share their environmental experiences and best practices to help inspire other schools and students on their eco journeys. The Peterborough Eco Education Awards are the perfect opportunity to bring together teachers, pupils, businesses and organisations, in a cumulative celebration of the achievements of pupils across the city . It is highly rewarding to see the sense of achievement amongst pupils for all the hard work they have put into their learning. The morning will be split into two sessions; the ‘Meet the Eco Organisations’ session will give pupils the opportunity to take part in eco-based activities during a series of interactive sessions run by local organisations. The second session, ‘Meet the School Experts’ will focus the attention on the school displays and will allow the pupils to talk about their projects, whilst sharing what they’ve done with other schools and organisations. In the run-up to the awards, pupils from across the city will be busy developing these projects which demonstrate their commitment to learning about the environment, ready for this session. This gives schools across the city the chance to showcase their environmental initiatives from the Framework and demonstrate the fantastic work that they have carried out over the course of the academic year. The presentation involves awarding schools their Peterborough Eco Framework certificates, chosen according to the projects that have been carried out during the year. Certificates are split into themes that follow the Framework, comprising of categories such as health and happiness, land use and wildlife, and local and sustainable food. For more information on the event or the Peterborough Eco Framework for schools please contact Jill Foster at PECT on 01733 866440 or email jill.foster@pect.org.uk. For further details, visit www.pect.org.uk.